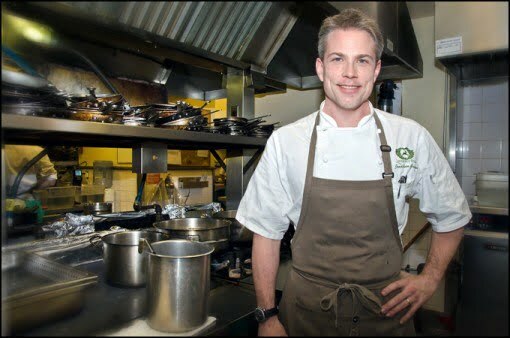 CAMBRIDGE, ONTARIO — If you’re a Canadian, you’ll want to shake Jonathan Gushue’s hand and thank him. Not just because he will have likely served you one of the finest meals of your life, but because he will demonstrate to you and anyone else who walks into the elegant walls of Langdon Hall that Canadian cuisine exists — and it wouldn’t look out of place at the head of the table. Our nation has earned a lot of respect in different arenas in recent years — from recognition for economic stewardship and human rights advocacy to Olympic gold medals — but the level of the cuisine turned out by our restaurants hasn’t garnered much international attention. If anything, we’ve been snubbed. Last year, the World’s 50 Best restaurants stunned Canada when it not only kept a restaurant off its list for an eighth straight year, it also did not list one among its 50 runners-up. While you can debate whether such subjective rankings matter, the shortcoming isn’t good for the national psyche of our food industry come each April, when the top 100 rankings are announced. Many chefs will say they don’t care about such awards — which are determined by peers, restaurateurs, other chefs, journalists and food lovers — yet they enter competitions and when the accolades do arrive the honoured restaurants will boast of the achievements. Recognition is good. It’s not all. Gushue has eschewed what so many restaurants do. He doesn’t aim to replicate the rich flavours of France with decadent ingredients flown in from around the world. Instead, much of what Langdon Hall’s kitchen uses is found in its vicinity — not unusual in these days of the locavore movement, but the recipes are also from close to home. When a meal starts with a bite-size biscuit of quinoa, flaxseed and hemp, with crème fraiche and honey made on the premises, the chef’s intentions are announced. Earlier, I had asked Gushue if Canada had a national dish. Although he said the closest thing might be tourtiere, a truer answer came with this opener. The flavours of that biscuit — which is the best granola bar you’ll ever eat — will find affinity with anyone from St. John’s to Tofino. A diner from another country may not get it, a Canadian will laugh as if Gushue has just shared an inside joke with you. The rest of the dinner service moves just the same. With snow crab from Labrador tasting so sweet and pure you actually do lick the salt from the east coast seas, and tender venison from nearby Stratford, Ontario, slicing away without any more force than a delicate push on a butter knife. Mushrooms featured in many dishes are foraged on the grounds of the property and the backyard garden produces about a quarter of the ingredients used in the cooking. The dishes are all damn great and, really, only the most elitist of diners will offer nit-picky complaints. Since moving over from Truffles, the former standout restaurant at the Four Seasons in Toronto, Gushue has racked up CAA/AAA 5-Diamond awards for six consecutive years and did land Langdon Hall on the World’s Top 100 list in 2010, coming in at 77. Gushue is from Newfoundland and perhaps for that reason he has a greater understanding of the nation’s regionalized cuisine and culture than other chefs. If anything, he’s certainly contemplated the diversity inherent in a nation that touches three oceans, while bringing his home province’s characteristic friendliness into his work space. Gushue, meanwhile, goes around from station to station mugging for the camera with his workers while beautiful lunch plates are prepped with trout and mushroom ravioli and the best fish and chips you’ll have this side of Scotland’s Caledonian Canal. I’d never eaten at Langdon Hall before last month. I left wondering why not. There really is no excuse. It’s less than an hour’s drive from Toronto. It has a restaurant with a large, open terrace in the summer and a warm bar, and serves three meals a day, as well as afternoon tea and Sunday brunch. Lunch at Wilks’ Bar isn’t expensive, with a large plate of those fish and chips, made with pickerel, costing $24, and washed down nicely with a glass of 1898 Pale Ale, produced locally at Grand River Brewing Co. The beer, made especially for the mansion, is named for the year Langdon Hall was founded as a private estate for the grand-daughter of American business magnate John Jacob Astor. Dinner is pricey, but far from outrageous for the quality of food. It might sound ridiculous to suggest something that costs $490 is a deal, but when that’s the price for a couple staying in the 52-room mansion for one night mid-week with three-course dinner and breakfast included, it’s not a stretch to conclude it’s a fair rate — at the least. Any concerns that Langdon Hall, which is marketed as a country manor, is overly formal or exclusive will evaporate upon an encounter with the cheery staff. In the end, going to Langdon Hall isn’t about determining where it might fit in among the top restaurants in the world. Gushue’s kitchen stands out for its unabashed Canadianness. A visit here is about discovering your country anew — and witnessing a chef push us forward in his field of endeavour in a quiet, unpretentious and oh-so-Canadian way. Getting There: From Toronto, take the 401 west heading toward Kitchener-Waterloo and London, and exit No. 275 (Homer Watson Boulevard/Fountain Street). Turn left (south) onto Fountain Street. Turn right onto Blair Road at second roundabout. Turn right onto Langdon Drive (the fourth street). The driveway leading to the mansion will be on your left. You can valet park at the front of the mansion, or self-park in the lot on your right before you reach the entrance.